It's a long story. Ready for that. It was a sudden idea that I wanna travel to Xinjiang. Before that, most of my holiday in China, I spent in bars or kept staying at home, everyday waiting for the delivery sending my waimai. 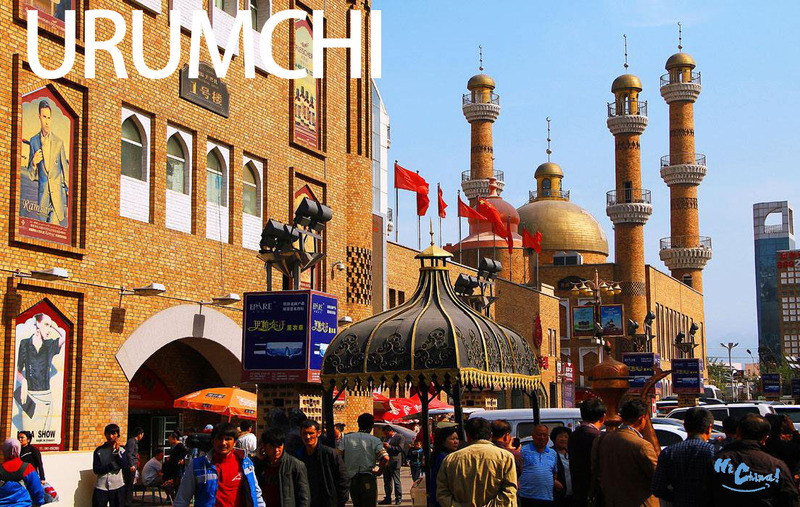 Well, Xinjiang has long been in my list that I really like to try. 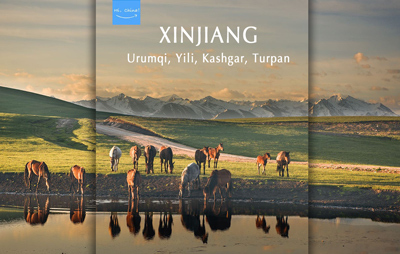 Xinjiang, covering at least 1/6 part of China, used to be distinguished from North Xinjiang to South Xinjiang. Normally, Chinese people call them Bei Jinag and Nan Jiang, which obviously means the north and the south, with Tianshang Mountains in the middle. North Xinjiang is famous for its scenery, like Kanasi, Tuwaer, Keketuohai lake and so on. They are the dream land of photographers. 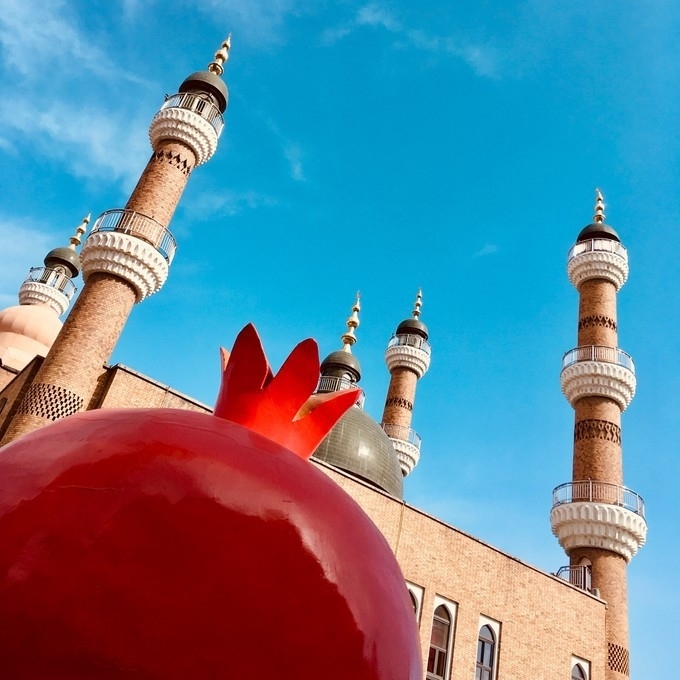 For the middle Xinjiang, Yili is the most important city, which is also the favorite land of young Chinese, especially young couples. South Xinjiang is totally different. There is the world's second largest Mobile Desert. From the west part to the east part, it's about 1000 km. Now even there are roads and people are planting trees and grass here, it's still one of the dangerous land on earth. My first stop is Kashgar Prefecture. Héytgah Meschit is the largest mosque in Xinjiang, and also one of the world's largest mosques. Once the leader of Iran, Grand Ayatollah Seyyed Ali Khamenei give a persian rug as a gift. It's a funny market, close to my hotel, and mostly, i found some great food here. And those young xinjiang people are nice. When it came to night, more stunning. Sheep, roast chicken, steak, a paradise of food. 07:00 am is a nice time, good for catching up with the local breakfast. 5RMB, cheap and the noodle tasted great. When my clock went to 10, the local time is still 08:00 am. I took on a taxi, 35RMB to the local market. It was crowded, people and dumb things, everywhere. I thought it was the market time. It should be a local custom, I guessed. One thing that need to be told is the local market opens in Sunday only, yes, only in Sunday. I planned to to go to Tashikuergan County next day. Because the ancient Tadzhikistan people live here, and it's just located at the border of China, Tadzhikistan, Pakistan and Afghanistan. Actually there are two ways to get to the Tashikuergan County. First one, take the local bus, a public bus. But it won't stop in the path, so you might miss the beauties around the road. The second one, join a car with others, then the driver would take you anywhere you want and stop for all. It's easy to find some guys in local youth hostel. The next destination is awesome! Well you can feel it through this pic. So this is the border of Pakistan and China. Well the pakistan people are so nice. Almost everyone were waiting to take photos with them. When I went back to the Taheman County, well, another city 50 km away from the Tashikuergan County, I met a local man. He was riding a motor. He can speak Chinese, great, I can speak a few, too. I was told that there was a wedding. I thought it was awesome to take a look. Thanks for the mate, he took me and rode on. I knew his name then, Yaer. They were so nice! I said some blessing words, but I guessed they couldn't understand. The only think I was sure, was that they were so happy to have a stranger join them. After the lunch, they had a game, Sheep Catching, an important event in a local wedding. Young men riding horses, tried to catch the sheep. The first one who get the sheep and throw it into the hole wins. Yaer said there would be a night party. I walked around the streets in the afternoon. The party was hold in a room like a Mongolian yurt. It was 1:00am when the party ended. I was tired, hungry and sleepy. Good news was, another big meal was ready. It was a very traditional dinner table, the old sitting on the top side, and we, the young sitting on the other side of the table. And they began to divide the sheep meat, old first and got the best meat, young last. Well, I was just too sleepy, couldn't remember too much. There was a Sheep Catching game in the morning too. But I woke up too late, missed it. But lucky, I met the beautiful girl I saw last night. She was a college student in Urumqi, a relative of the bride. I didn't see the bride. They said that the new bride wouldn't show up when the wedding was still going. She was masked even on the wedding. Yaer was an officer in the local county government. I was taken to his new wedding room, he was going to get married next year too. I intended to find a hotel in the town, but Yaer just gave me key of his new room and said it was ok to sleep in his home. I was so grateful to get this great and special treat. It was hard for me to trust a stranger usually, I mean really. I was touched by these lovely local guys. I got up early in the next morning, had some drinks, took a photo and said lots of thanks to Yaer. Goodbye. I met a businessman near the bus station, he said he was going back to Kashgar too. I paid 120 RMB because the public bus was about to go after 40 minutes. I thought he would go instantly, but he said he need to carry more passengers to go. I was angry for I just paid 120 RMB. The driver knew he was wrong, bought some local meat food to me, and said he would go soon. Then I saw a young man wondering around the station. I asked if he was going to kashgar too? And he said yes. Good! Then there came another two passengers, the driver finally started the car. I got that the young man was a self travler too. He came from Taiwan, used to live in Taipei. He tole he can go anywhere in Xinjiang, except for the border police station. We slept in the local hostel at night. In the morning, I, together with the young Taiwan man, walked around in the city. I said goodbye to the young man for he was going to take the flight back to Taipei next day. I found the bus station and asked if there were buses to Makit. Well, Makit is also a county of Kashgar Prefecture. It's just located at the southwest corner of Taklimakan Desert. Makit is the name of an ancient leader, whose people lived in the center of Taklimakan Desert. Well, you won't believe the center of Taklimakan Desert used to be a paradise. But it is true. This is where the British and Chinese United Scientific Expedition Team started their great journey crossing the deadly desert. The taxi here was so cheap, 3 RMB for the start price. He must regard me as a journalist of some big newspapers, hahaha. I went to the border of the great desert, only to find that the local government had been planting bush and grass long ago, changing the desert into a nice grassland. That's a great job! At night, I thought it would be different in Xinjiang. But actually, seems everywhere in China, people love to dance together in the square. This is a very long road in desert. It took five hours on the bus, really a long way. There is restaurant called Sushi Beef Noodle, quite nice, but the BBQ in front of the restaurant is more suggested. Wensu Canyon is not far from Akesu, I thought. Actually it's about 30 km. The local Xinjianger can't speak Chinese or English. I totally can't understand the local language. So before i left the bus station, i found the station officials and they helped write the destination in local words. One hour later, the driver turned back and looked at me, said something i couldn't understand, but I thought it was my station. I got off, and walked to the gas station, where there was a young official. He spoke Chinese quite well. The bad news is there is few buses to the Wensu Canyon. All right, I waited for an hour. Finally a young boy rode a motorbike to fill fuel here. I asked if he could take me to the canyon. Well, I gave him 50 Yuan, and that's deal. The young boy comes from Gansu Province, he lived here with his family, living on planting apples. I walked on the long, wild road for two hours, didn't saw a single person and the entrance. Lucky again, a tourism bus coming! This is a tour group from Beijing! I was so excited to see some guys who can speak English. Thank god! I think next time, i should join a travel group, no matter how expensive it is. This canyon is so beautiful, and also so distant from cities. Thanks for the driver, the group leader and other travllers! I got a phone call from my mom when i took the bus back to Akesu. She was so worried that she couldn't contact with me. The cellphone signal was so bad when i was in the canyon. Frankly, I was missing home when i was back to the downtown of Akesu. I missed my mom, my father, my lovely home so much. Kuqa has a long history, dating back to A.D 60 of Han Dynasty, where the old kingdom Kucina is located. Now it belongs to Akesu. This is a King palace, not bad, but I thought it was boring. It was so impressive to have a meal like this. Yes, Kizil Cheonbuldong, another Thousand Buddha Caves, also called Qianfodong in Chinese pronunction. The canyon and the Kizil are not far from the city. It was not expensive in my mind actually. I took a taxi there, played for a half day, with just 200 Yuan. I have so much confidence after the hard journey in Wensu Canyon. Anyway, it can't be worse. There was a report before i started my trip. There were 28 terrorists caught by local polices, just one month before I started. Though there was no buses, some drivers would pass the canyon when they are going to Dongfeng Coal Mine. It's just a pass-by car. This is a road called Duku Road, absolutely ranking the third most beautiful road i have seen.